Tool to calculate the grayscale histogram of an image. 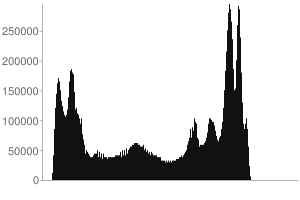 An histogram is a graphical representation of the repartition of colours among the pixels of a numeric image. Team dCode likes feedback and relevant comments; to get an answer give an email (not published). It is thanks to you that dCode has the best Image Histogram tool. Thank you. How to compute an histogram? An image histogram is a type of statistical graph with ordered colors on x-axis and the number of pixels for each color on y-axis which allows to quickly assess the distribution of colors in an image. In practice, the colors are usually limited to 100 or 255 levels of gray, the image is previously converted into grayscale. How to compute a grayscale value? Histogram is based on the frequency of luminance in the image. The luminance is computed for each pixel with the formula 0.2126*R+0.7152*G+0.0722*B (ITU BT.709). How is organised an histogram? The colors are organized according to their tone, blacks are on the left and on the right are whites, in the middle are gray tones. How to display an Histogram in Matlab? Use the imread function to load an image, then imhist to display its histogram. Improve the Image Histogram page!